DALE JOHNSON FLINT LOCK from Jim Chambers Flintlocks, Ltd. announces a new and exciting Golden Age styled flintlock - the "Dale Johnson" lock. The expert minds of Jim Chambers, LC Rice, and Dale Johnson have created a new Germanic influenced lock of the Siler/Chambers style. The "Dale Johnson" (a backwoods East Tennessee craftsman and engraver) lock plate is the approximate size of a large Siler but featuring a 1/8" drop in the tail and a banana base line curvature reminiscent of the Transition period. 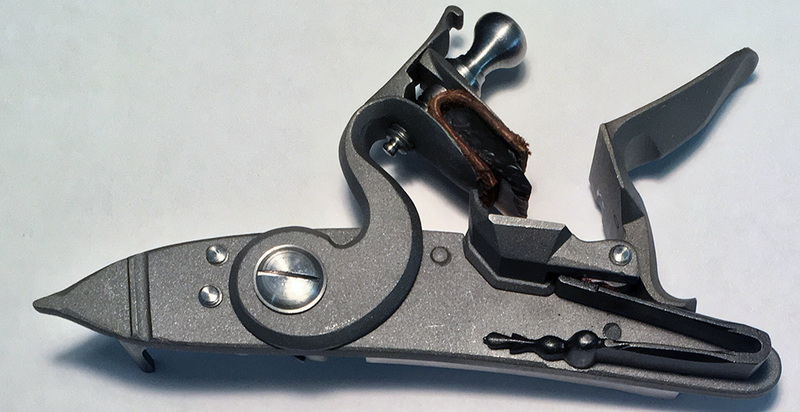 The pleasing lines of this lock will transition into the wrist of any rifle in a very graceful manner. By using the Chambers' Golden Age hammer and tumbler combination on this lock plate they have produced a lock with comparable speed to that of the notoriously quick Chambers' Late Ketland. Dimensions: 5 �" x 1"